1969 Plymouth GTX in San Diego, CA for sale. 1969 Plymouth GTX Real nice 69 GTX , number matching 440 block/trans. ( YES TO THE CAR ) 440 , six-pak piston , 906 ported heads , .557 mopar solid cam ,six pack intake w/ 3 500 cfm holleys on top. Would bet good bottom 12 car. re-built 4 spd. , new clutch and plate Hays stuff, Dana 60 3.54 gear lift-off six-pack hood , Interior all new carpet, seats , dash nice. Both bumpers been rechromed , new front tires and good BFg drag radial 275s drums brakes all new , new master Car needs exhaust from sitting , headers are thin , and mufflers are shot. So you can either put manifolds on it or ... Also have original radiator for it. 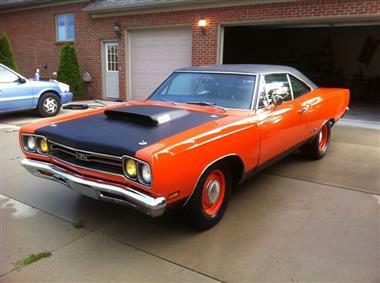 This vehicle is priced $17,826 less than the Average Market Price of $51,826 for a 1969 Plymouth GTX. This is a Good Deal as it's priced 34.0 % below market avg. The Pie chart below shows the number of ads within different price ranges.